How long will this continue? Will Ence return to the store only to find that it has closed? Will Locke suggest that he try Walmart? Will Ence then discover that this particular Walmart is not open all night? Will Ence then begin a long, hard journey only to discover that The Batman was within him all along? 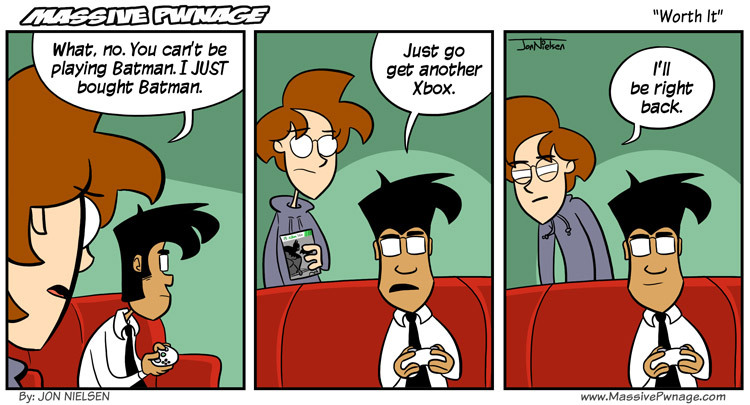 This entry was posted on Monday, October 24th, 2011 at 12:00 am and is filed under Comics. You can follow any responses to this entry through the RSS 2.0 feed. Both comments and pings are currently closed. New possibility: Frustrated by these events, Ence decides to turn to evil. Epic conflict between Jokence and Batlocke is bound to follow. Staying tuned. Ehm if he gets another Xbox… Is there another TV or Display? Or Ence have to buy this as well? Are there enough outlets for this new T.V. and Xbox? Will Ence have to buy a power strip also? In the end when Ence finally has all he needs to play, will he walk into the room only to see Lock play through the ending, dashing his hopes and dreams like a clam smashed open on the belly of an otter? It turns out that Ence IS the Xbox.